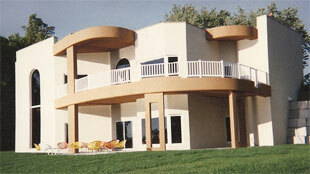 Insulated Concrete Form (ICF) systems for concrete building solution have evolved over the last two decades. The new Polycrete® Big Block ICF system introduces a revolutionary solution with its sturdiness, performance and fast installation. The Polycrete® Big Block ICF system is manufactured with a reinforcing steel mesh embedded within the expanded polystyrene (EPS). This steel wire mesh incorporated within the EPS panel results in extreme strength and unmatched wall stability. The Polycrete® Big Block ICF is the largest on the market. At 16 square feet of wall, its large size and simple design result in a fast and economical installation process. 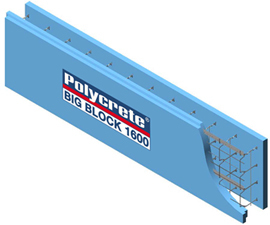 The Polycrete® Big Block ICF product is the only system on the market that resist to a lateral pressure of 1600 lbs/sq ft (75kPa) during concrete pour. It brings incomparable performances for ICF installation and concrete pour, but also a significant energy saving. The Big Block is definitively adding values as it gives security, durability, quietness and comfortable buildings. All materials used in a Polycrete® ICF wall bring thermal insulation performances above all required standards. The specifications are for 6" concrete walls with interior and exterior sidings. Block height: 24" (61 cm). 12" (30 cm) also available. 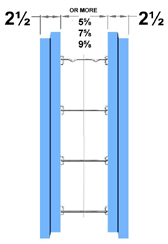 (min) at 10% distortion lb/sq.in.